It all begins with a truck and a trailer pulling into Marquette’s Tourist Park during the 3rd week of July. Slowly, a group of dedicated volunteers begin to unload a stack of wood and materials as if they were going to build a house. That’s not far off, for over the next few days, this group of people will build a house for music on the lawn. 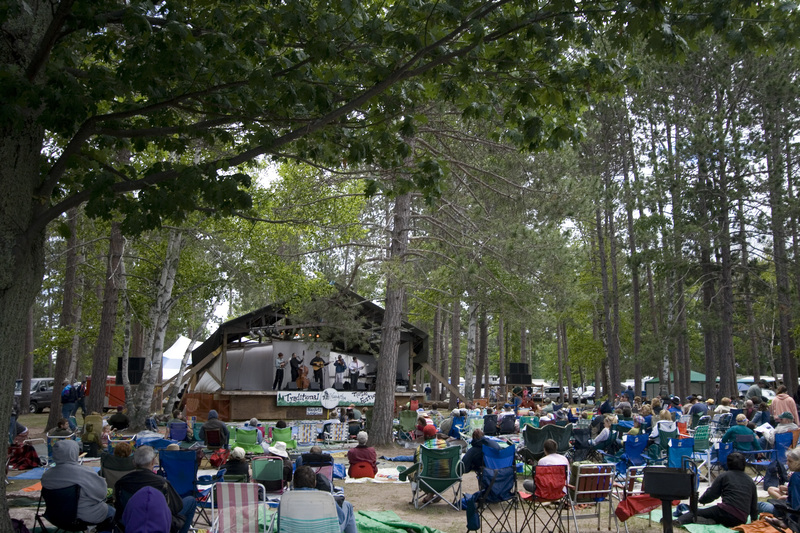 Looking like a half built Yooper camp, this is the main stage for the Hiawatha Traditional Music Festival, which for 36 years has been presenting the best of American and world folk music to the community of Marquette. But Hiawatha is more than just folk music or the main stage. It is about the dozens of volunteers who make it happen each year, the performers both paid and unpaid who entertain and even educate the public and the hundreds of families and individuals who attend. It is the children who work on crafts all weekend and parade their wares during the Children’s Parade and the dedicated people who help them along the way. It is the people who direct the traffic along the road and in the park itself. It is those who count the money and tokens, and check tents for camping passes. Everyone who attends Hiawatha plays a role: listener, dancer, supporter, volunteer, performer and vendor. But no one is truly passive. To attend Hiawatha is to be part of something greater than oneself. Whenever you see links like this, simply click and listen to performances from festivals past or watch festival goers discuss what makes Hiawatha so special. This exhibition was created by the Beaumier U.P. Heritage Center at Northern Michigan University in collaboration with the Hiawatha Music Co-op. It was funded in part by a grant from the Michigan Humanities Council, an affiliate of the National Endowment for the Humanities.